Doug Yates - Master Instructor: Master Yates began studying karate November 1, 1973 under the instruction of Sensei Dale Holzbauer in Xenia Ohio. From there he continued his training until Master Yates opened The Shorin Kenpo Karate School 1976. Master Yates currently holds the rank of 8th Degree Black Belt. 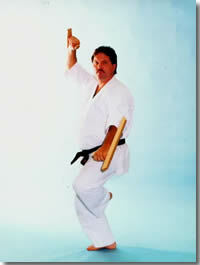 Master Yates has personally trained under Master Yuichi Kuda (Deceased) and Master Roy Thomason. Master Yates currently trains under the watchful eye of Master Sonny Johnson of Muncie Indiana. Master Yates has received training from Master Don Madden, Master Ron Lindsey, Master Ken Penland and Master Phillip Keopple. He credits all these outstanding teachers for his development. During his Kickboxing days Master Glen Keeney, Master Herb Johnson and Master Bill "Superfoot" Wallace were instrumental in his success as a The Ohio State Champion and World Rated Competitor with the Professional Karate Associatioon (PKA). Master Yates has been active in all aspects of martial arts, from traditional training to tournament competition and even amateur and professional kick boxing where he holds various titles in tournament action. Master Yates has traveled around Ohio and the United States promoting Martial Arts and training many students in the arts of Shorin Kenpo Karate, Okinawa Shorin Ryu Matsumura Kenpo Karate and Okinawa Matsumura Seito Shorin Ryu Karate. Master Yates has been instrumental in the success of many of his students in the area of local and regional tournament competition and currently is the President of the Miami Valley Tournament Association. Inducted into The United States Martial Arts Association "Hall of Fame"
Inducted into The Ohio Black Belt "Hall of Fame"
1996 Inducted into The World Karate Union "Hall of Fame".